A good video flows from one event to another. Including scenes which are confusing, boring, or just unnecessary distracts your audience. To hold their interest, you need to remove shots that don't help to advance the action, make your point, or show something worth seeing. Video Edit Magic provides you two easy ways to remove unnecessary footage: cutting and cropping. Moments of confusion- When you start shooting your subjects (i.e. your family members) may be slightly confused about whether the camera is on, should they start talking, etc. Film of someone hesitating is unnecessary footage. It does not say anything about the video's story. Drawn-out action- A video should engage the viewer, with a sequence of events keeping his/her interest. Keeping the viewer’s attention is difficult when an event takes a long time. While editing, you can remove footage of long, drawn-out actions. Filming problems - If some of the footage is shaky, uses the wrong camera angle, or doesn't properly frame the action, you will want to cut it out and not include it in the final Video Edit Magic makes it easy to remove video footage. Video Edit Magic’s Timeline consists of tracks like video, audio, visual effects and transitions, which can be used for editing. The Timeline is where video and audio clips are placed for editing. The following controls can be used for editing. Selection sliders: To edit parts of tracks, it is necessary to select them. To cut or crop, use the Selection Sliders to choose the range you need to remove. The sliders Selection Sliders (with the red handles) are highlighted and labeled '1' and '2' in the above illustration. If you want to Cut, Copy or Crop a particular section, drag the Selection Sliders' handles to enclose a particular area of the clip. Any operation (Cut, Copy, Crop) will affect the area marked by the Sliders. Seek Slider: To mark a point on the Timeline to preview or Split, use the Seek Slider. Drag the Seek Slider (using the blue handle) to the exact location where you want to Split. The Preview Window always shows the video at the exact point on the Timeline shown by the Seek Slider. When you Play the Preview, the Seek Slider moves across the Timeline to match the video and audio being played. Now that you are familiar with the Timeline, you can begin editing. Edit commands are on the Edit menu, except for Split Timeline and Split Track, which are on the Tools menu. Cut and Delete- Both Cut and Delete remove footage from the video and audio clips. The difference is that Cut puts the removed footage into the Windows Clipboard, so that it can be Pasted to another location on the Timeline. 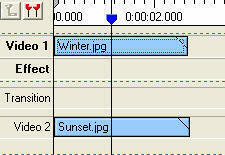 Crop- Cut deletes the selected range in the Timeline. Cropping deletes everything except the selected range. When you Crop, only the portion you have selected using selection sliders is kept. Everything outside is removed. You can select exactly which tracks to crop, from one to all. Crop Source- Crop Source works like Crop, deleting what is outside the Selection Sliders. The difference is that Crop Source only affects clips which are touching the Selection Sliders. Other clips are not changed. In the diagram below, there are 2 clips on video track 1. The Selection Sliders are only touching Winter.jpg. After Crop Source, only the unselected portion of the first clip is cut. The second clip is unaffected. 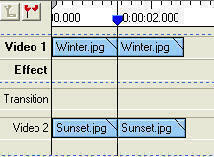 Resizing clips- The starting and ending points of a video clip can be adjusted by just dragging the left or right edge. Resizing clips lets you change the duration without losing any of the action in the clip. Of course, if you make a video clip shorter by dragging the edge, the action will be speeded up. If you make it longer, the action will slow down ("slow motion"). 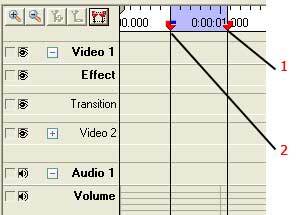 Changing the length of audio clips this way will change the pitch of the voices (higher or lower). Splitting Timeline- When you choose to split the timeline, you can cut any or all of the clips that are under the Seek Slider. If you click the split button or choose Split Timeline from the Tools menu, the Which tracks would you like to split? Window appears. You can split any selection of tracks. If you select all the tracks, the result is much like cutting a layer cake, with cuts appearing in every layer. While Crop removes video footage across tracks, Crop Source removes footage on a single video clip. From the File menu, click Open File. Select the media files that you want to edit and then click on Open. The media files will be displayed under the Media Files tab of the Collections window. Select track Video 1 or Video 2 where you want to place clips. Select the file by clicking it. On the Edit menu, click on Add to Timeline. On the View menu, click on Selection Sliders or use the F5 shortcut key to show the Selection Sliders. Drag the Selection Sliders from their handles and select a range of the timeline that you want to retain. On the Edit menu, click on Crop or use Crop Source. Once you have finished redundant, boring, or just unwanted footage, it's time to take it to the next level: applying video effects, using Transitions, adding Narration, and more. With Video Edit Magic, editing can be fun. Astounding video effects like animated transform help you create a masterpiece effortlessly.